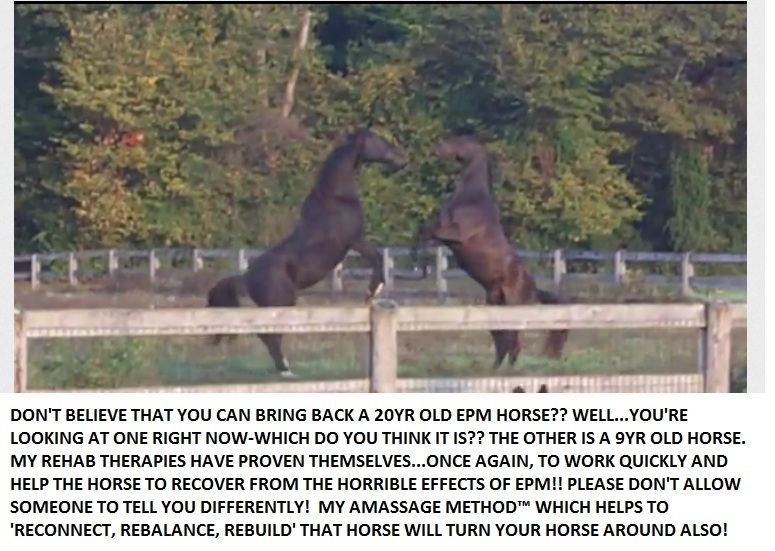 My REHAB THERAPIES are for EPM, COLD AND SWAY BACK HORSES, ARTHRITIS AND CHRONIC BUCKERS! The Therapies/groundwork/riding that I use has proven itself over the last 10yrs to work and work quickly. I can usually turn a horse around in about a month, depending on the severity of the problem. My EPM Rehab was just recently used on 2 horses at the Kansas State University Vet Hospital. If you cannot bring your horse to me, I also can do Internet Coaching for many of my Groundwork Strategies. I prefer to do the work hands on, or even refer you to a student in your area-and that is what we will try to do first, but if we cannot-then the Internet Coaching is always possible. At just $50 week to help you rebuild your horse, it’s a small price to pay to help them REbuild! Welcome to my blog, I appreciate you coming here and spending your time to read about The Amassage Method™. It helps owners understand the ‘attitudes’ of their animals, along with educating them about how it could’ve happened and what we can do to prevent it from happening again. Finding that my 4yr old Anglo/Arab had severe hock arthritis, made me look into learning to Build muscles rather than have the injections that were suggested he have done. Knowing that helping to build the entire horse, and helping to make them stronger, I developed my Groundwork Strategies to do just that! I also was able to do the same work for EPM horses, sway back, cold back, by adding additional Therapies and Massage to the Groundwork. Using a Memory Release for COLD BACK horses is extremely important and takes alot of time. I have been working on horses and teaching these Therapies to my students, and they have also been very successful using my step by step program. For information on the Curriculum, Schedule, prices, etc! I have a 17 yr old gelding who was pro level barrel horse who was hit with EPM 2 yrs ago. Treated , retested negative . He atrophied right shoulder and right hip. He feels great, we have been using him to move cattle just lately and he seems to enjoy having a job again. Of course I would never dream of putting him back on the barrel pattern the way he is now. I was under the assumption that his muscles never come back. Any possiblity you would want to use him as a project for your classes? I can’t afford to send him for you to rehab but wod love to see him return to he normal self.